Create a sophisticated presentation at your next catered event or special meal with the Majestic Collection of combo plastic plates and combo plastic bowls. 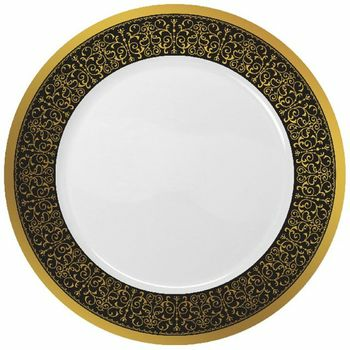 A gorgeous gold or silver border gives this heavyweight plate/bowl a distinct and charming style that combines the convenience of plastic with the elegant appeal of China. Available in burgundy, black, and blue.